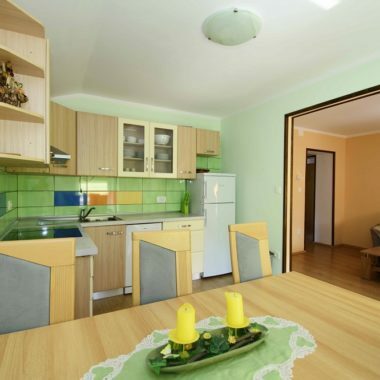 The Orhideja (Orchid) Apartment House is located in the center of Tolmin. It has a large yard where you can park your car or bicycle. Nearby the apartment is park with children’s playground. All apartments have access to the internet, by convention guests can also order a breakfast. Tolmin is a small town, caught between the rivers Soča and Tolminka, near the junction of the Soča River Valley, Bača Gorge and Idrijca River Valley. For centuries Tolmin has been the natural center of the province, called Tolminsko. Tolmin has an old part of town, modern library, a stadium and other sports facilities. A permanent archaeological, historical, ethnological and art history exhibition is planned in the Tolmin Museum. The parish church, dedicated to the Assumption of Mary, has a typical baroque tabernacle and roccocco-style mensa of the high altar. And right next to this beautiful church you will find the Orhideja apartment house. You can enjoy the park near the church, with your children playing in the playground or you can go explore the town. 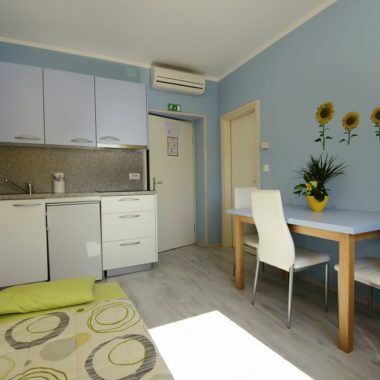 Tolmin offers the luxury of having everything you need close together. Post office, health care center, shopping center or a fragrant cup of coffee are only one step away. The wonderful natural environment is perfectly suited to all visitors. There are many tended pathways along lakes and rivers, as well as tended access to waterfalls and gorges. Visitors can ramble through forests and gorges, or climb higher to mountain villages situated above the valleys; more demanding trekkers may set out on serious tours between mt. Krn and Črna prst. Fishing is the most popular tourist activity in the region; the local fishing association manages over 145 km of waterways, with navigation allowed only on the Soča. All other rivers – Nadiža, Tolminka, Bača, Kneža, Koritnica, Idrijca and Trebuščica – are reserved exclusively for anglers. Each river has its own unique and interesting character, enabling anglers to find at least one river for fishing even in less-than-favourable weather. Among the diverse population of fish, trout are prevalent, with the Soča trout the most well known along with a sub-type called lipan. Soča Valley is an active nature amateur’s paradise. Among sport activities attracting an increasing number of those fascinated by adrenaline adventures to the Soča Valley today, paragliding with outstanding thermals, steep mountain slopes and unforgettable panoramic views offers top flying opportunities and long cross-country flying above the Julian Alps. 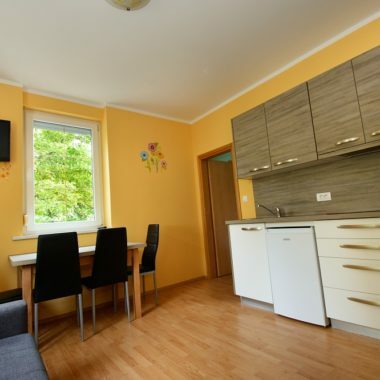 Choose from a variety of different room sizes and apartments. Good wifi and very close to the city center. Very kind staff! Everything was likable. It was comfy, cool, clean and generaly enjoyable.